Hailed as “Four Recorder Virtuosos” by The New York Times, and “mind-blowing” by the Los Angeles Times, QNG - Quartet New Generation took top honours at the 2004 Concert Artists Guild International Competition and at the renowned German competition Deutscher Musikwettbewerb. QNG mesmerizes its audiences through innovative programming that juxtaposes contemporary and early music. The quartet&apos;s unique, high-energy mode of performance inspires new works and creates a dynamic and exciting forum for exploring the music of our time. 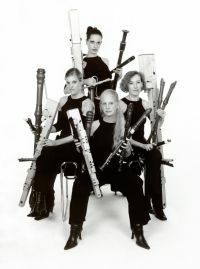 Performing on upwards of 30 different recorders of varying sizes and shapes during the course of a typical performance, the Quartet transports the listener into new sonic worlds, confirming the recorder’s viability as a modern classical instrument. Taking advantage of the large recorder family and its flexibility, QNG is constantly searching for new possibilities of sound and expression. The instruments played by the Quartet include a large number of accurate copies of authentic historical instruments plus modern recorders. The diversity of the instruments, paired with QNG’s theatrical flair and high-intensity performance mode, inspires composers to write in fresh and exciting ways that define the music of our time. With a large repertoire of European works, the collective has begun commissioning American composers. QNG has attracted broad and enthusiastic audiences throughout Europe, North and South America, Japan, Southeast Asia, Caucasia and the United States. QNG - Quartet New Generation was founded in September 1998 at the Amsterdam Conservatoire and the University of Arts, Berlin. The collective was also awarded the top prizes at the International Gaudeamus Interpreters Competition for Contemporary Music in the Netherlands; the International Chamber Music Competition for Contemporary Music in Poland; and the ‘13ème Concours International de Musique de Chambre’ in France.